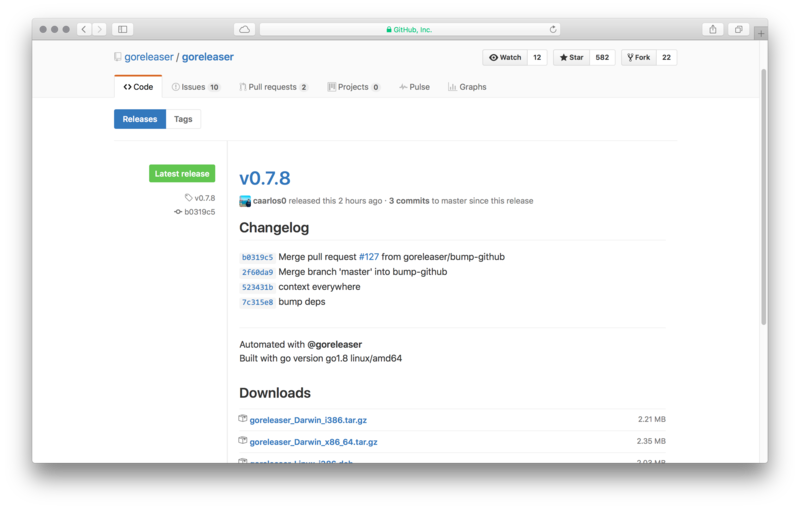 GoReleaser is a release automation tool for Go projects. The goal is to simplify the build, release and publish steps while providing variant customization options for all steps. GoReleaser is built for CI tools; you only need to download and execute it in your build script. Of course, you can also install it locally if you wish. You can also customize your release process through a .goreleaser.yml file. You can install the pre-compiled binary (in several different ways), use Docker or compile from source. Download the .deb or .rpm from the releases page and install with dpkg -i and rpm -i respectively. Download the pre-compiled binaries from the releases page and copy to the desired location. ATTENTION: Currently, the provided docker image does not support the generation of snapcraft packages. Note that the image will almost always have the last stable Go version. The DOCKER_REGISTRY environment variable can be left empty when you are releasing to the public docker registry. If you need more things, you are encouraged to keep your own image. You can always use GoReleaser’s own Dockerfile as an example though and iterate from that. Please follow the relevant steps on our contributing guide. In this example we will build, archive and release a sample Go project. You can customize the generated .goreleaser.yml or leave it as-is, it’s up to you. If you are not using vgo or Go modules, then you will need to comment out the before hooks in the generated config file or update them to match your setup accordingly. 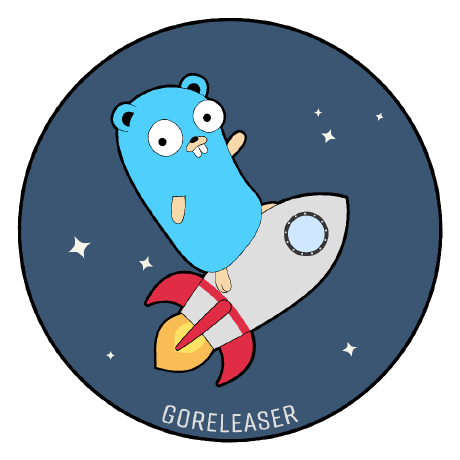 GoReleaser will build the binaries for your app for Windows, Linux and macOS, both amd64 and i386 architectures. You can customize that by changing the builds section. Check the documentation for more information. After building the binaries, GoReleaser will create an archive for each OS/Arch pair into a separate file. You can customize several things by changing the archive section, including releasing only the binaries and not creating archives at all. Check the documentation for more information. You’ll need to export a GITHUB_TOKEN environment variable, which should contain a valid GitHub token with the repo scope. It will be used to deploy releases to your GitHub repository. You can create a token here. $ git tag -a v0.1.0 -m "First release"
Attention: Check if your tag adheres to semantic versioning. If you don’t want to create a tag yet, you can also create a release based on the latest commit by using the --snapshot flag. GoReleaser enforces semantic versioning and will error on non compliant tags. Your tag should be a valid semantic version. If it is not, GoReleaser will error. The v prefix is not mandatory. You can check the templating documentation to see how to use the tag or each part of the semantic version in name templates. Unfortunately, GoReleaser does not support CGO. You can see the discussion about this in this issue. You can see the comments on the issue referenced for workarounds on it. GoReleaser requires a GitHub API token with the repo scope selected to deploy the artifacts to GitHub. You can create one here. This token should be added to the environment variables as GITHUB_TOKEN. Here is how to do it with Travis CI: Defining Variables in Repository Settings. If none are set, they default to GitHub’s public URLs. IMPORTANT: be careful with the URLs, they may change from one installation to another. If they are wrong, goreleaser will fail at some point, so, make sure they’re right before opening an issue. See for example #472. You can override this by changing the ldflags option in the build section. GoReleaser provides multiple customizations via the .goreleaser.yml file. You can generate it by running goreleaser init or start from scratch. The defaults are sensible and fit for most projects. GoReleaser was built from the very first commit with the idea of running it as part of the CI pipeline in mind. Let’s see how we can get it working on popular CI software. # docker login is required if you want to push docker images. # DOCKER_PASSWORD should be a secret in your .travis.yml configuration. - test -n "$TRAVIS_TAG" && docker login -u=myuser -p="$DOCKER_PASSWORD"
Note the last line (condition: $TRAVIS_OS_NAME = linux): it is important if you run a build matrix with multiple Go versions and/or multiple OSes. If that’s the case you will want to make sure GoReleaser is run just once. By default, drone does not fetch tags. plugins/git is used with default values, in most cases we’ll need overwrite the clone step enabling tags in order to make goreleaser work correctly. In this example we’re creating a new release every time a new tag is pushed. Note that you’ll need to enable tags in repo settings and add github_token secret. CloudBuild works off a different clone than your github repo: it seems that your changes are pulled to a repo like source.developers.google.com/p/YourProjectId/r/github-YourGithubUser-YourGithubRepo, and that’s what you’re building off. The push to any branch trigger could use a Dockerfile or a cloudbuild.yaml, whichever you prefer. You should have a dedicated cloudbuild.release.yaml that is only used by the “push to tag” trigger. In this example we’re creating a new release every time a new tag is pushed. See Using Encrypted Resources for how to encrypt and base64-encode your github token. The clone that the build uses has no tags, which is why we must explicitly run git tag $TAG_NAME (note that $TAG_NAME is only set when your build is triggered by a “push to tag”.) This will allow goreleaser to create a release with that version, but it won’t be able to build a proper changelog containing just the messages from the commits since the prior tag. # Setup the workspace so we have a viable place to point GOPATH at. In Sempahore 2.0 each project starts with the default pipeline specified in .semaphore/semaphore.yml. # which may be automatic or manual and optionally depend on conditions. Check Managing Secrets for more detailed documentation. GoReleaser can also be used within GitHub Actions. You can create a workflow like this to push your releases. This should support almost everything already supported by GoReleaser’s Docker image. Check the install section for more details. If you need to push the homebrew tap to another repository, you’ll need a custom github token, for that, add a GORELEASER_GITHUB_TOKEN secret and remove the default GITHUB_TOKEN. The default, auto-generated token only has access to current the repo. Projects that depend on $GOPATH. GitHub Actions override the WORKDIR instruction and it seems like we can’t override it. In the future releases we may hack something together to work around this, but, for now, only projects using Go modules are supported. Does your company use goreleaser? Help keep the project bug-free and feature rich by sponsoring the project. Love our work and community? Become a backer. This page will eventually have information for those who want to contribute to the project. Also check the CONTRIBUTING.md file on the root of our repository. Tutorials made by the community. Want to add your tutorial here? Please do! Click on the improve this page link bellow! Made with ❤️ by GoReleaser contributors.